So begins Hugh Howey’s first novella in his blockbuster Silo series, Wool. 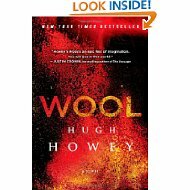 I can’t exactly remember when I first heard about this guy, Hugh Howey, but I do remember his name popping up all over twitter and blogs, and I thought “Hell, I’ll give this guy a go.” At 99c for his first novella, Wool, it was a pretty good bargain, and having received my first kindle for Christmas 2011, I was looking for cheap books to fill it. I read that first book in one sitting then immediately downloaded the second part (“Proper Gauge”) and then the third one (“Casting Off”). I remember staying up until the early hours of the morning to finish “Casting Off”, and making myself wait until the next morning to download the final two in the series “The Unraveling” and “The Stranded”. Briefly, the Silo series is set in an apocalyptic world, where humans live underground in huge silos 144 stories below the ground. It’s set in a time when no-one can remember what happened on the outside, and no-one questions why they live the way they do. That is, until Jules comes along. Jules is a mechanic from the Down Deep, the very bottom levels of the silo, where she works to keep the machinery of the silo functioning. Needing a new sheriff after the tragedy that is Holston’s death (which is so hauntingly written in Wool 1), Jules is the one who steps up (albeit reluctantly). Her curiosity gets the better of her, and she begins to question everything she has ever been told about the history of the silo and the circumstances of their existence. Wool 2-5 follows Jules’ story – the consequences of questioning long-held beliefs, and the lengths that some will go to to protect the status quo. The reason I love these books so much is that they focus on something that is a real problem in our own time – taking what we see for granted, and living our lives through computer screens. We listen to politicians and the media and assume that what they tell us is the truth. We have no real desire to do the hard work and find information for ourselves. We form opinions on someone else’s view of the world, instead of seeing it for ourselves. I know from reading interviews of Hugh that those were major factors in his desire to write this series. I came away from that first series feeling like I needed to be more involved in the world around me; to take a more proactive role in my own life, instead of sitting back and letting it happen. For any of my teacher friends out there, if you’re looking for books to spark discussions with students, these are the books to read. On a slightly different tangent, Hugh is also a shining light for those of us looking to self-publish our own stories. Hugh began with a small publisher with his first Molly Fyde book (Molly Fyde and the Parsona Rescue), a YA science fiction novel, and quickly learned that he could do a lot of the publishing side of things himself. The popularity of his Silo series made bigger publishers and agents sit up and take notice, and he made history when he signed a print only deal with Simon and Schuster, enabling him to keep his digital (ebook) rights. This is extremely significant, because traditionally, contracts from publishers effectively restrict authors from writing and publishing anything that is seen to be in competition to the books they’ve sold, which really means everything that comes after. I won’t bore you with the ins and outs of how that deal will hopefully help to change the publishing industry in the long term, and how they treat their authors, but suffice it to say, it’s a small step in the right direction. There is so much more I can say about Hugh Howey and the effect he’s had on the self- and indie-publishing industries and authors, but I will leave the other stuff for another post. The last thing I will say is BUY HIS BOOKS! I guarantee you won’t be disappointed.